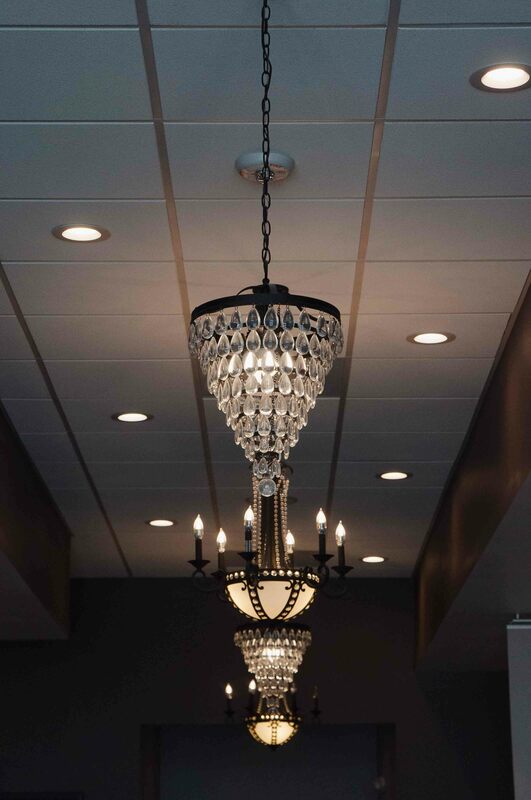 Allow our expert staff to bring out the best in you! 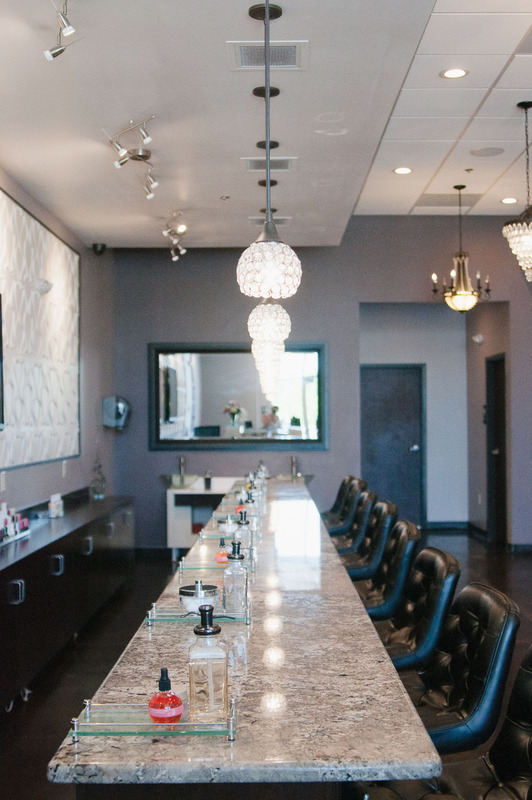 Blush specializes in nail therapies, waxing, and first-rate customer service. 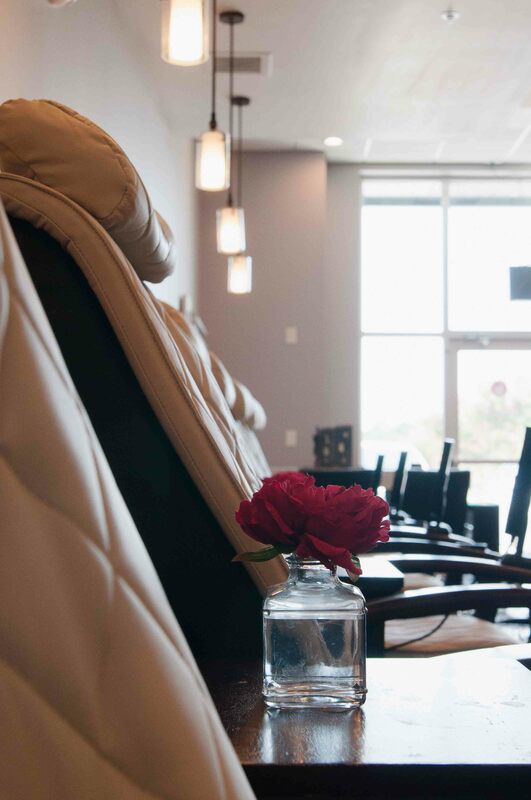 We have created an indulgent menu designed to relax and rejuvenate your mind, body, and soles. 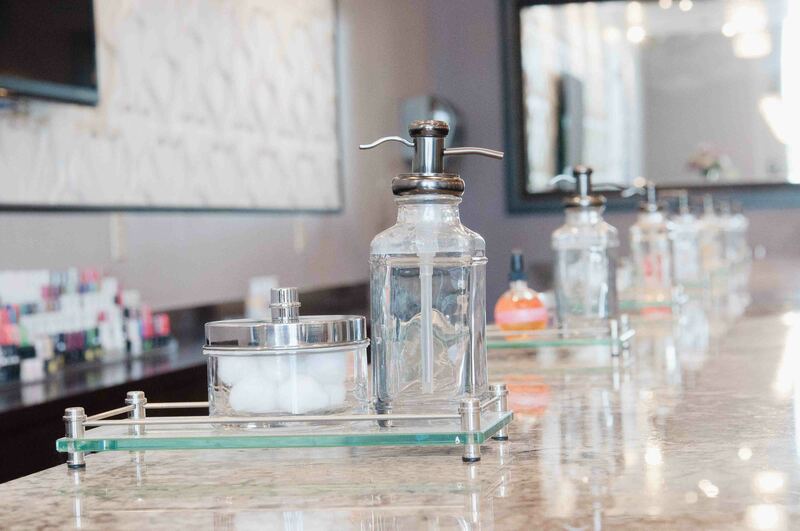 Along with your pampering, receive a complimentary soft drink, water, or wine while you relax. Please call us today to book your appointment! Beautify your hands with this nourishing treatment that includes cleansing, shaping, and cuticle care. 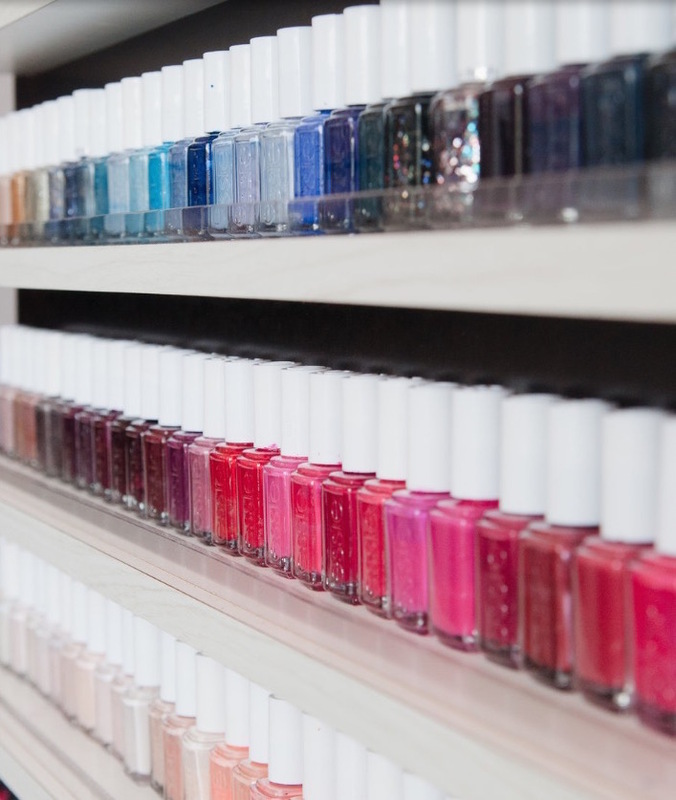 Top it off with a massage using an aromatic scent of your choice and the perfect polish application. Spoil your hands with this lustrous hand treatment that includes meticulous cuticle detailing as well as a smoothing lavender and essential oil exfoliation to improve skin’s texture. Then, let us melt your tensions away with an indulgent warm soy candle massage. Youth boosting “hand facial” with an organic lavender mask in heated mitts to condition skin. Enjoy an organic lemongrass green tea scrub to refine and a paraffin masque for deep moisture. Soothe you senses with an organic citrus hand and arm massage topped off with a soothing massage and hot towel wrap that will leave you feeling revitalized. Beautify your feet with this nourishing treatment that includes cleansing, shaping and cuticle care. Top it off with a massage using an aromatic scent of your choice and the perfect polish application. For feet needing extra T L C… Our uniquely blended treatment leaves feet not only looking amazing, but also feeling amazing! Allow skin to glow with our liquid callus serum followed by a sugar and mineral polish. Envelope your feet in a deeply emollient paraffin masque. Lock in moisture with a hydrating and therapeutic warm lotion massage completed with a hot towel wrap. Begin by soothing your senses with a warm lavender neck wrap. Undergo an intense callus treatment and delight with an invigorating organic green tea scrub. Pamper yourself with both a hydrating organic lavender leg mask and a deep-penetrating paraffin therapy. Release all the stresses of life with and extended foot and calf massage that includes an organic emulsion combined with hot stones. You will be floating on clouds after this decadent service! This revolutionary product applies like polish and cures in a UV light, so that it wears flawlessly for 14 days. Eliminate nicks as well as dry time. 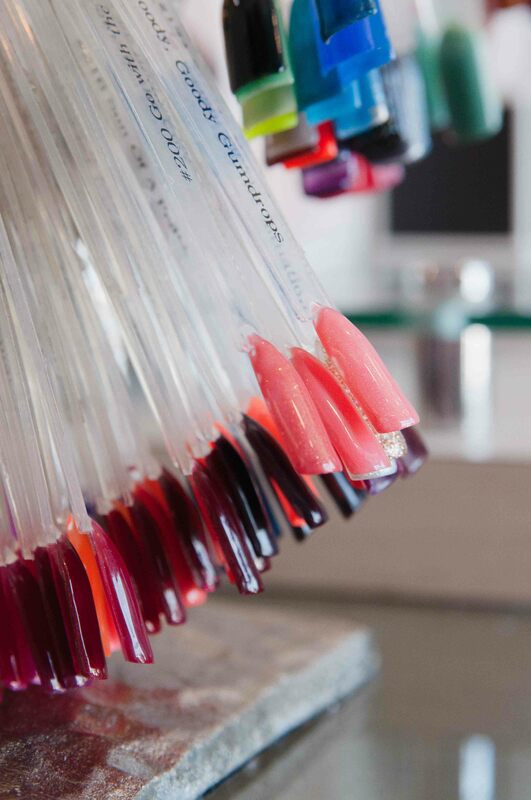 We use the highest quality gel polishes to keep your natural nails in optimal condition as well as perfectly pretty. Add long-lasting protection and shine to natural nails without harsh chemicals. This cutting-edge system provides added thickness to weak or thin nails by utilizing a powder fortified with Calcium and Vitamin E to promote natural nail growth and strength….great for those transitioning from artificial nails or needing extra durability without damage to natural nails. A sweet petite treat for your little princess that includes shaping, cuticle care, a vanilla cupcake shimmer massage, design on each hand free of charge and a “quick dry” finish to keep nails from smudging. For ages 10 and under. Every little girl’s dream is to be pampered like a princess. Allow your little one to indulge in a sweet sugar scrub exfoliation, vanilla cupcake shimmer massage, complimentary designs on big toes and a keepsake princess tiara to top off the experience. Enjoy the durability and low-maintenance of this enhancement used to reinforce naturally weak and brittle nails. Also known as the “permanent French” this system is increasingly growing in popularity due to its clean, shiny, line-free and smudge-free finish. It boasts a non-yellowing formula done in a double process with a white powder on the free-edge and pink powder on the nail bed. Veer off the norm and select from an array of fun powders mixed with assorted colored shells and glitter to create a unique and beautiful finish sealed with an ultra-shiny gel coating. A highly resilient product for those wanting a super-glossy finish. It is highly recommended for those who are constantly using their hands (especially those in a lot of water). Give yourself a boost of confidence with professional shaping and removal of unwanted hair. Can’t wait for you to FALL in love with our Apple Pie Pedicure! Begin with a gentle exfoliation of glycolic for stubborn heels, followed by a vanilla scrub composed of mineral-rich Dead Sea salt and Ayurvedic oils. Next, lock in moisture with a warm keratin treatment for feet as well as a deeply nourishing honey and clay mask enclosed by a hot towel wrap. Ease the tensions away with a 10-minute apple cinnamon massage that incorporates hot stones…and top this off with an Apple Pie Martini that will leave you feeling Apple-y Ever After! 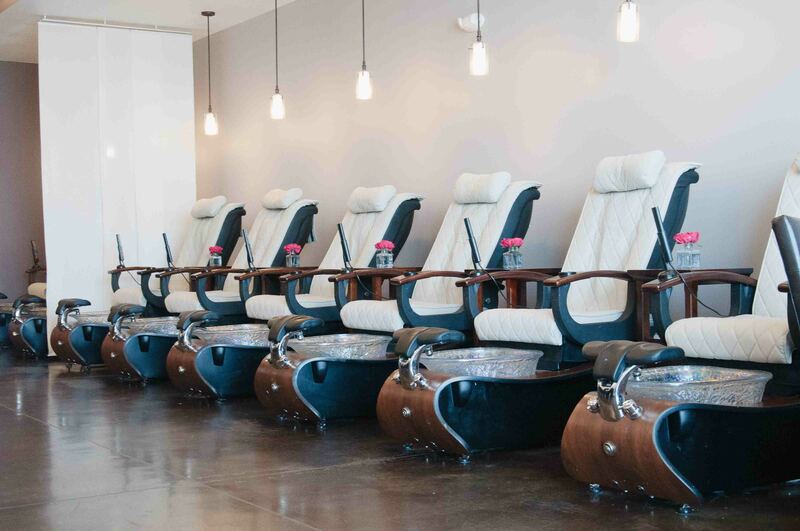 RECEIVE DOUBLE LOYALTY POINTS with this pedicure. 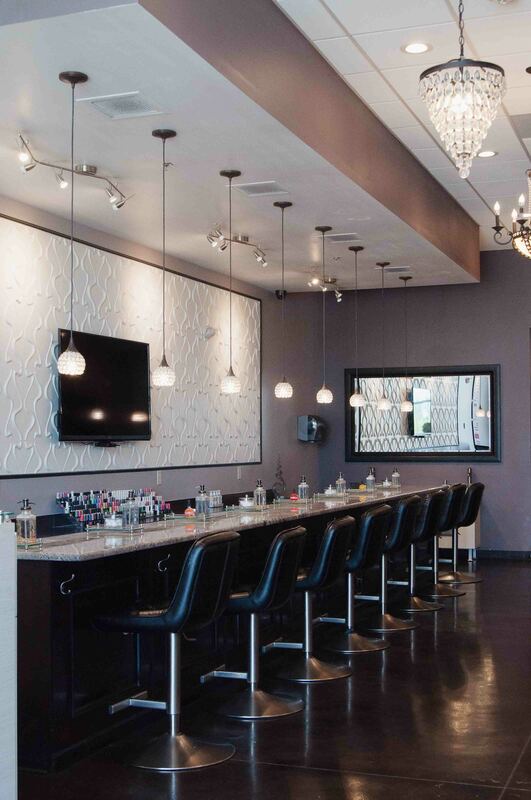 Join us for “happy hour” on Wednesday and Thursday from 3-7pm with Blushtinis served with all services! ​We value your patronage and want to reward our clients with a loyalty program. 1 point for each dollar spent. 100 points for first-time clients. 50 points for rebooking in advance. 250 points for each referral. You can redeem your points once you have accumulated 1000 points for a $10 credit towards your next purchase. 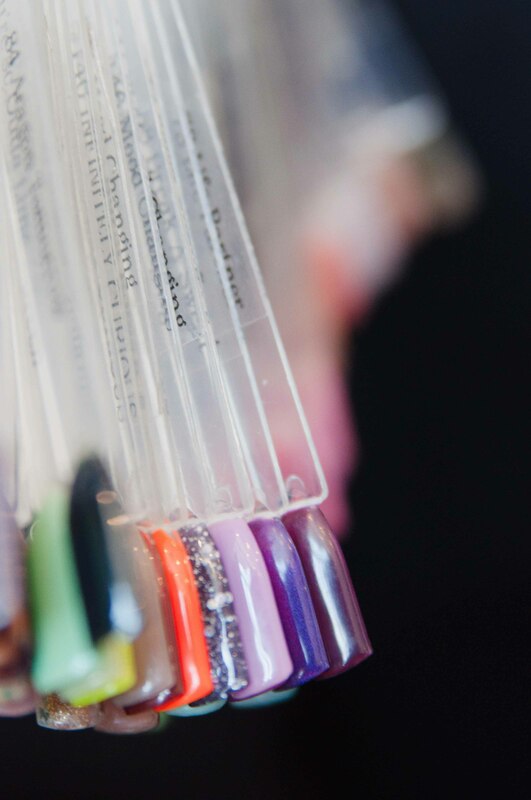 If your gel polish chips within 7 days of service you are welcome to call and schedule an appointment to have the gel polish repaired at no cost to you. All we ask is that you call within the 7-day period. 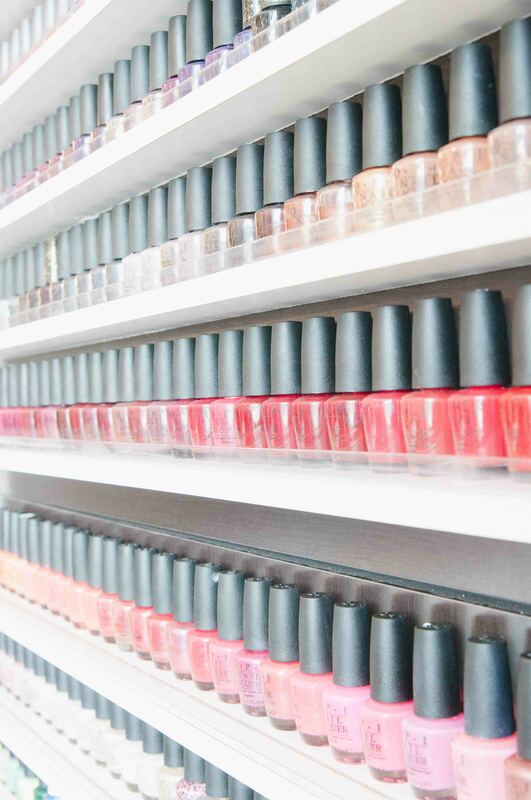 We highly recommend scheduling appointments. Walk-ins will be accepted if we have cancellations or availability. Please have the courtesy to call if you are running late or unable to come. There is a 15-minute grace period for appointments. If you do not call or show up within that time your appointment will be lost. At this time Blush gift cards can only be purchased by coming into the salon. There is a one-year expiration date on gift cards. We are not responsible for lost or stolen gift cards. 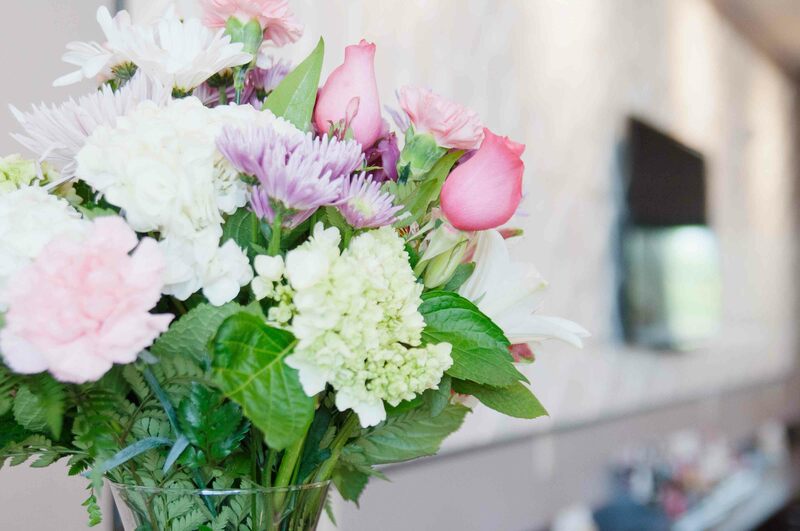 Blush is available for private parties and special events. A $10 deposit is required for each person booking and will be applied to services rendered. A 24hr notice of cancellation is required. Otherwise, the deposit will be forfeited. 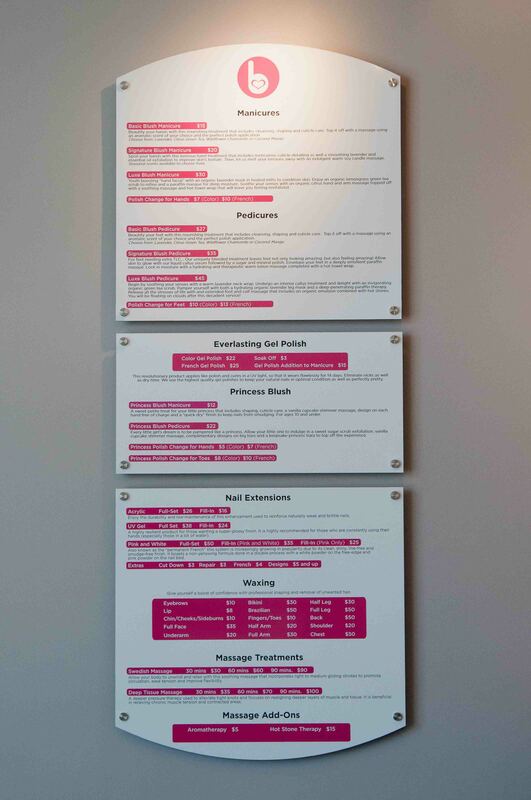 For inquiries please contact us at: info@blushnailbarandspa.com. . When making appointments please let us know if you have any health conditions, allergies, or injuries. After 3 NO-SHOWS we will require a credit card number in order to schedule any future appointments. If you miss a scheduled appointment or no not give proper notice your card will be charged for the full amount of the service.